The deadly bombings at a Turkish airport could be the start of a new wave of terror attacks, worried U.S officials told NBC News. "Our long summer of discontent has just begun," a senior intelligence official told NBC News Tuesday evening. The use of multiple suicide bombers fits the M.O. of ISIS — not the Kurdistan Workers' Party, or PKK — and so does the target, in this case Ataturk International Airport in Istanbul, they said. "There are only two groups capable of carrying out such a large scale attack," a senior U.S. counter-terrorism official said. "This does not fit the PKK profile, they go after Turkish targets, not international targets." Also, ISIS is far more bloodthirsty than the Kurdish rebel group, which has been battling Ankara for years and tends to go after military targets. "This is indiscriminate, which fits the ISIS profile," the official said. Ambassador James Jeffrey, a former U.S. diplomat who worked in Turkey and Iraq, agreed. "There have been four attacks in Turkey by [terrorists] in the past year," he told MSNBC. Officials said they were unaware of any "chatter" preceding the attack. But they said there had been a "heightened state of alert" across Europe for months. Jeffrey said perimeter security at the airport appears to have prevented the terrorists from penetrating deeper into the airport. A hero cop who died in the blast may have saved dozens more when he wrestled one of the invaders to the ground. 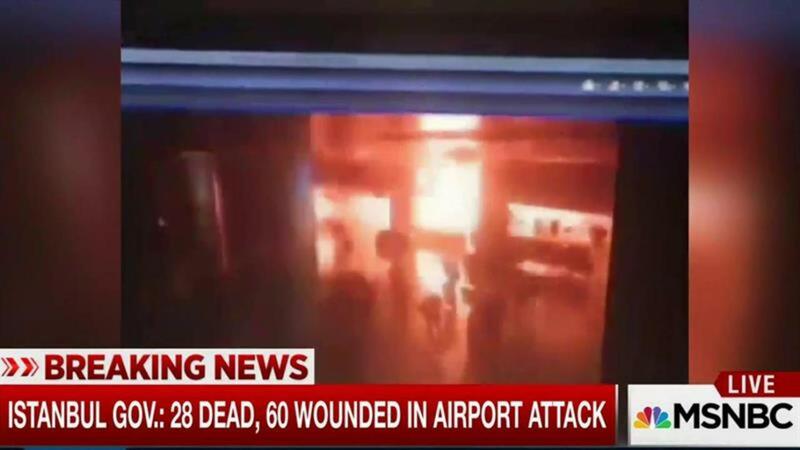 "A porter who we use, someone we have a long relationship with, was with another customer in the airport and heard an explosion," NBC News' Richard Engel said on MSNBC TV. "He saw a police officer wrestling a man on the ground, a man he'd tackled. A short time after that, he saw the suicide bomber explode."